The #1 selling case for mobile healthcare systems. If you're looking for the most durable case for smartphone usage in hospital environments that also provides backup charging, Beam makes the case. The Beam platform offers an all-in-one solution combing externally swappable batteries, a highly protective case for cleaning, and multiple charging units to suit your needs. Beam can be used with mobile EHR systems, secure texting, and soft scan applications. Beam’s lightweight and ergonomic design provides unimpeded call quality. 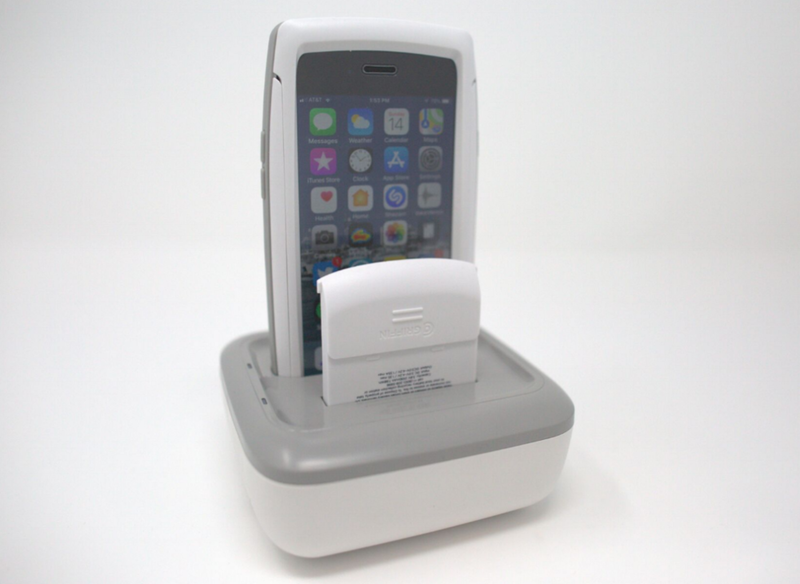 Beam offers a fully-enclosed and ergonomic case for iPhone healthcare deployments. Designed with healthcare grade plastics and to meet an IP54 rating for dust and water resistance, Beam holds up against leading hospital grade cleaners and disinfectants. For fast-paced environments, Beam’s impact-resistant polycarbonate shell is designed to protect the iPhone from occasional drops. The Beam team has years of experience in designing protective enclosures for tablets and smartphones. Externally swappable batteries (2100 mAh) provide continuous battery life for long work shifts, without the need to take the device out of the case. You keep going uninterrupted. Beam offers multi-charger units including a 5-bay charge dock, 10-bay battery-only versions, and single charge station. Beam supports iPhone 8, 7, 6 and is MFI-approved.